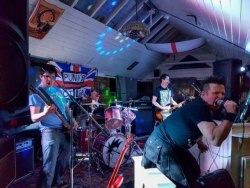 Formed in 2009, we are a 4-piece punk band based in Northampton/Milton Keynes. We started out playing covers but now we mainly play original songs (although we can occasionally be tempted out to play a set of classic punk covers). We write songs about things that make us smile that get into your head until you can t help singing along. We tell rubbish jokes and we re a bit cheeky as well. We play because we love it and we put on a fast-paced, energy packed live show. We can tailor our set to suit a family audience too if required.